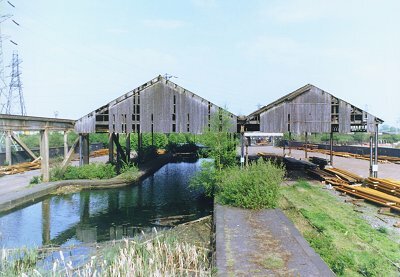 Bridge over the entrance to the basin, the sheds of which can be seen on the right. (Photo by Alex Chatwin, July 1998). The single remaining arm of the basin. Photo by Bev Parker, June 2000. Listing: 1902. 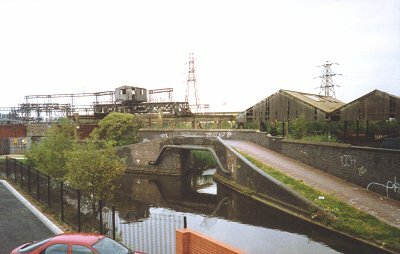 Chillington Interchange Basin was rebuilt in 1902 by the London and North Western Railway, after it had acquired the bankrupt Chillington Iron Company, which was originally served by the basin. It is a rare (possibly unique in Britain) survival of an interchange basin complete with canopy. Comment: Codling remarks that "Wolverhampton was remarkable for the number of railway-canal interchange 'stations' that were constructed". In all he finds six operated by the LNWR, two by the GWR and one by the MR. Of these, this is the only survivor. Shill calls this basin the Monmore Green Basin. Originally there was one basin here, later enlarged to two, all owned by the Chillington Iron Works and linked to their foundry by a 2ft 6in tramway. The Chillington Iron Company went into receivership in 1885 and their land was sold off in 1885 and 1886. The LNWR bought the basin and built the sidings and branch railway after they had acquired Parliamentary powers in 1898. At that time they built the present basin, with two equal length arms. One arm was removed in the 1930s leaving the present single arm. The entrance and side bridge were not changed. Thanks to the late Alex Chatwin for his help on this page.